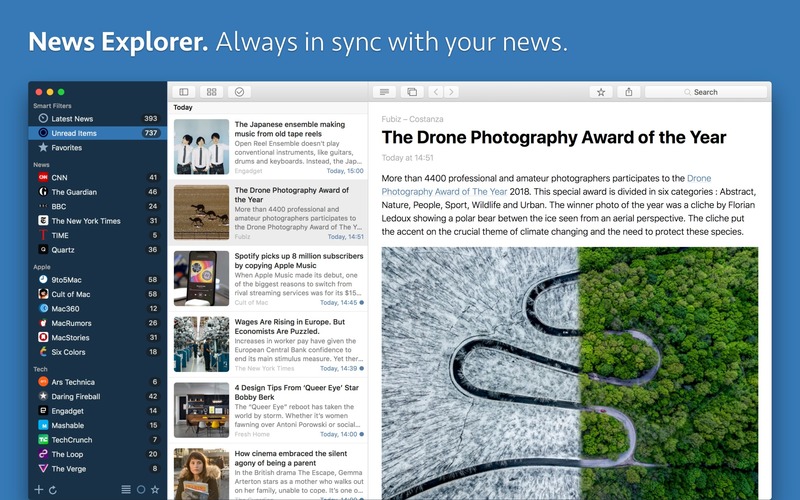 News Explorer is an innovative easy-to-use news reader exclusively built for the Apple’s ecosystem, with iCloud based synchronisation between Mac, iPhone, iPad, iPod touch, Apple Watch, and Apple TV. You can now set a preferred article view modus for each individual feed. For example Mercury Reader view ‘CNN’, Feed Article view for ‘MacRumors’ and Website Article view for ‘Dezeen’. Long press the Reader view button to select a primary view. The Mercury Reader view engine now works locally. The Arc90 Readability performance has been dramatically improved. The article list can now be set to ‘Poster’ view, in addition to the existing view options. Poster view shows a preview image under the header and summary of each article. The height of the preview image can be adjusted in the Preferences panel. Automatic detection and correct display of RTL languages. Timeline view supports now the same article views as the article list. Unread and read items can now be stored forever instead of a limited period. Long words in the article viewer are now being hyphenated, if the language of the feed is known. Countless other small tweaks and fixes.